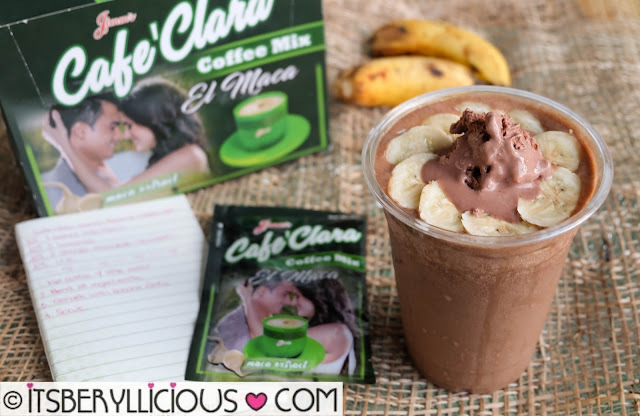 I've written about the all new Jimm's Cafe Clara with El Maca before, and here I am again, sharing an interesting way to enjoy your usual cup of coffee. We may often drink coffee mixes on its own, just by adding hot water to give us the energy we need throughout the day. But for people who are not really into the bitter taste of coffee, here is a recipe that you will surely like. The first time I tasted Café Clara, I thought it was sweet, creamy and nutty, perfect to drink cold rather than hot. I recently came up with a quick and easy recipe that is both refreshing and revitalizing, to provide the extra boost of energy I need all day. 1. Mix coffee and water in a cup. 2. Put bananas in a blender. 4. Blend all ingredients together until smooth and creamy. This recipe is a surefire energy booster that can help you stay awake and energized to do daily activities. It is also a great post-workout smoothie, so you won’t feel so tired and drained after every workout. The el maca extract helps with enhancing the stamina and endurance, while the potassium in banana helps with muscle function and performance. The addition of ice cream gives a nice sweet touch to the drink, and at the same time provides added fuel to the body. There are many ways to enjoy Café Clara, other than the usual cup of coffee. You can also add it on baked goods like brownies, cakes and pastries, or even make your own coffee jelly. Unleash your creativity and share your own Cafe Clara recipe now.